ST JAMES PRIORY IS THE OLDEST BUILDING IN BRISTOL. St James is a Roman Catholic Church. Mass is celebrated every Sunday at 8am. St James Priory is managed by the St James Priory Project Charity. It does not have a Parish status and therefore does not have its own dedicated congregation. Consequently there is a need to raise donations to provide for ongoing maintenance. The parish of St Mary on the Quay provides a priest to celebrate Mass. From 7th May 2019 Abbot David Charlesworth (OSB) will be celebrating Sunday Mass at 8am. On Tuesday – Saturday he will be available for Confessions at 12.30. He will celebrate Mass at 13.05. The Priory Church of St James is a Grade I listed building situated next to Bristol’s Bus Station. It was founded in 1129 as a Benedictine Priory by Robert Earl of Gloucester, the illegitimate son of Henry 1. The nave survives from 1129 but the tower was added around 1374. The south aisle was widened and rebuilt in 1698. The porch dates from the late 18th century, and the north aisle was rebuilt in 1864. 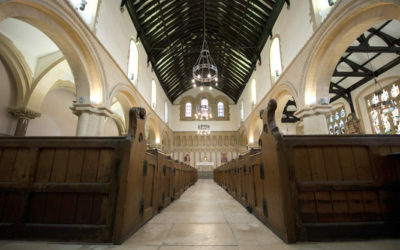 The Priory Church has benefited from a £4 million restoration, conservation and development programme which lasted from October 2009 until it re-opened in July 2011. The Heritage Lottery Fund provided a £3.2 million grant and the St James Priory Charity was required to match fund £1.2 million pounds. We are indebted to the HLF and the numerous trust funds and private donations that allowed this restoration work to proceed. PLEASE CLICK ON THESE LINKS FOR A SUMMARY OF THE WORK AND IMPORTANT ASPECTS OF THE CONSERVATION AND DEVELOPMENT WORK. St James Priory has been preserved not only for future generations but also for the specific benefit of individuals and groups today. We rely on donations for the continued upkeep of the Priory and its charitable works.